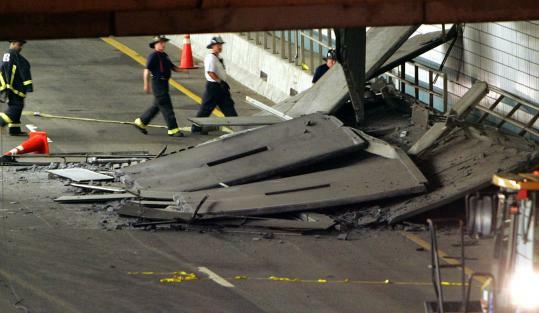 The largest contractor on the Big Dig and a bolt distribution company have agreed to pay $26 million for damages stemming from the fatal collapse of the Interstate 90 tunnel, as the total settlements negotiated by state and federal prosecutors surged past half a half-billion dollars. Modern Continental Corp., the Cambridge company that earned $3.2 billion on the mammoth project, agreed to a settlement of $21 million for damages resulting from the collapse of ceiling panels in the I-90 connector tunnel on July 10, 2006, that killed Milena Del Valle, a passenger in a car driven by her husband, Attorney General Martha Coakley said yesterday. In a related agreement, Newman Associates Inc., the Canton company that sold Modern Continental the epoxy that was supposed to secure the ceiling panels, has agreed to pay $5 million in damages, state prosecutors said. Newman bought the epoxy from Power Fasteners Inc., the Brewster, N.Y., company charged last year by Coakley's office with manslaughter in the disaster. Those charges are pending. "Today's settlement marks another step toward resolving the remaining outstanding claims related to problems in the Big Dig tunnels," Coakley said in a statement. The settlements come on top of $458 million that Bechtel/Parsons Brinckerhoff, the consortium that oversaw Big Dig design and construction, and two dozen other design firms agreed to pay in January after negotiations with federal and state prosecutors. Last year, Aggregate Industries paid a $50 million penalty to the state for its role in providing 5,700 truckloads of substandard concrete, material not implicated in the ceiling collapse. In all, authorities have negotiated $534 million in settlements on the project, which has been plagued by cost overruns, leaks, and the ceiling collapse. Leo V. Boyle, one of the lawyers who negotiated settlements of more than $28 million for Del Valle's family in a wrongful death suit against Modern Continental and other defendants, said the sum announced yesterday was substantial, considering the company's dire financial straits. Modern Continental sought the shelter of US Bankruptcy Court on June 23, saying it had up to $1 billion in debts. "The spotlight throughout much of the case in the popular press has been on Bechtel and Powers, but what this settlement demonstrates is the deep involvement of the companies that selected the type of epoxy to use and then actually applied the epoxy," said Boyle, who was not involved in the settlement disclosed by prosecutors. If the settlement is approved by the bankruptcy court, the $21 million will be deducted from what the state has withheld from Modern Continental on Big Dig construction contracts. Modern Continental has filed legal claims seeking $95 million for work performed, but the state has said it owes less. The state has not paid Modern Continental in about a year. Modern Continental said in a statement that it was "pleased to have reached this global settlement, which avoids the prospect of years of protracted litigation and believes it to be in the best interests of all of the parties and of the Commonwealth's citizens." The company did not admit liability for the ceiling collapse. The cost of repairing the tunnel to date is $39.5 million, said Klark Jessen, a spokesman for the state's Executive Office of Transportation. Mac Daniel, a spokesman for the Massachusetts Turnpike Authority, declined to comment on the settlement. Modern Continental still faces a mountain of legal troubles. US Attorney Michael J. Sullivan brought 49 criminal charges against the company on June 20, alleging that Modern Continental knew that bolts were coming loose in the ceiling of the tunnel, but glossed over the problem until the panels fell. If convicted, Modern Continental faces criminal fines of up to $500,000 for each of the charges of making false statements, submitting phony time and materials slips, and wire fraud, or $24.5 million in all. No individual executives or employees were charged. Three days after federal prosecutors filed the charges, Modern Continental filed for bankruptcy protection. The late Lelio "Les" Marino started Modern Continental 31 years ago with a wheelbarrow and a $4,000 sidewalk contract in Peabody and transformed it into a construction giant on the back of its Central Artery work. But for the past five years, the company has been considered a virtual shell corporation, teetering on the edge of bankruptcy and kept on life support by its surety company through the infusion of hundreds of millions of dollars. The settlement disclosed by Coakley prohibits Modern Continental from doing further work on the Big Dig. In addition, $2 billion in performance bonds on the company's 14 remaining contracts - mostly maintenance, repairs, and finish work - will run for six years. The bonds will be available to the Massachusetts Turnpike Authority to pay for costs that arise as a result of hidden defects in Modern Continental's work. The agreement, which also involved Modern Continental's bonding companies, resolves tens of millions of dollars in lawsuits that Modern Continental and the Turnpike Authority have filed against each other, including claims concerning the cost to repairs leaks in Big Dig tunnels. In September, Del Valle's family reached settlements with the last and largest of the defendants in the family's wrongful death lawsuit. The family of the 38-year-old Jamaica Plain woman will collect more than $28 million, including $18.1 million from Modern Continental, Bechtel/Parsons Brinckerhoff, six smaller companies, and the Turnpike Authority, according to the family's lawyers. Yesterday's tentative settlements leave four defendants facing claims by the state in the Big Dig ceiling collapse, said a Coakley spokeswoman: Gannett Fleming Inc., the Pennsylvania designer of the ceiling; Sika Chemical Corp., a New Jersey epoxy manufacturer; Sigma Engineering International Inc. of Rhode Island; and Conam Inspection & Engineering Services Inc. of Auburn.